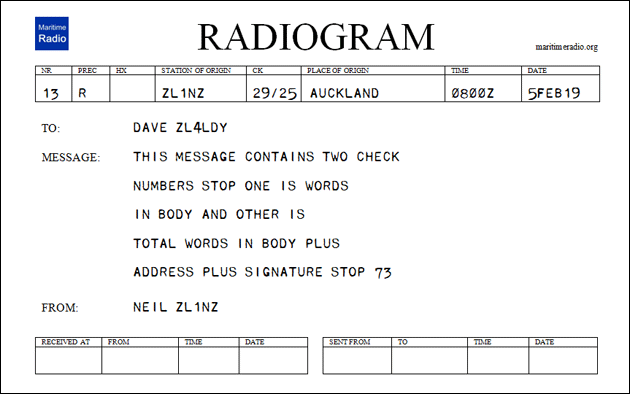 On the New Zealand Net, messages are exchanged in a formal style that will be familiar to all operators with traffic-handling experience. It is worth mentioning a couple of points that may differ from what operators have seen before, particularly those ops who have used the ARRL message forms. 1. Messages are preceded by CT NR. In other words the receiving operator copies everything after that, until the end of message signal AR. 2. The four parts of the message (Preamble, Address, Body and Signature) are separated by BT. 3. The Check (Word Count) in the Preamble contains TWO numbers separated by the slash “/” symbol. One is the number of words in the Body only. The other is the total number of words in the Address (not including line break symbol AA), Body plus Signature. Words in operator notes (if any) are not counted. Here’s a sample of a formal message composed in the style used on the VK and ZL nets. The HX field in the Preamble is rarely used, and is blank in this case. The fields at bottom right are Operator’s Notes and would be filled in after sending the message.